Most of my shooting is done solo, but a couple weeks ago was the first outing of the Rocky Mountain Film Photographers, on what turned out also to be Film Photography Day. It was a a turly enjoyable experience, though — I got to meet the talented Craig Pindell in person, and shoot the breeze with the always fun Shoot Film, Ride Steel and others. We started the day with a stop for coffee and conversation at Boyer’s Coffee Shop on North Washington Street in Denver (a long drive for Craig). I had a large Caffé Americano and some more dark roast coffee on top of it because I’m a sucker for decent rocket juice. While at the coffee shop I borrowed a table and set up my recently-acquired Harrison Film Pup Tent to load some 4×5. The tent is a short story in itself — I’ve had several cheap changing bags and all have fallen apart, so I decided to do it right for once. I’m tired of wasting gaffer tape holding them together. I figured if I was going to pay a bit more for quality, I might as well buy something freestanding, too. So far I’m really pleased. Inside the tent I opened a “fresh” (read: unopened, but expired since 1978) box of Kodak Plus-X Pan and loaded four film holders. I discovered later that in at least three cases I messed up one side and got the film in the path of the slide, which stopped me from getting the dark slide back in after making a frame. Three sheets wasted and three images made — the three I’m posting this morning. But here’s the thing. My journey back into film after some years of shooting digital began in 2010 and has been almost exclusively solo. The first photo walk (or anything like it) I ever participated in was just last year. And aside from the reminiscing of my friends in The Post’s photo department, I’ve rarely had anyone to even discuss film with offline. So it was actually very exciting just to hang out with some other people with a film obsession like mine. We swapped stories and jokes over drinks for a while and then made our way to our second stop. I’m not sure “shoot” is the best word for it — it was really more of a photographic expedition. We caravanned over to the J W Duff Aircraft Co — the near-tragic events of that drive were the subject of a review last week — where the new owners let us wander the salvage yard for several hours. As I discovered when I called to arrange the visit, the lot’s original owner, J.W. “Bill” Duff, had died in 2013. Duff spend sixty years building his lot into the largest in Colorado, and possibly the country. 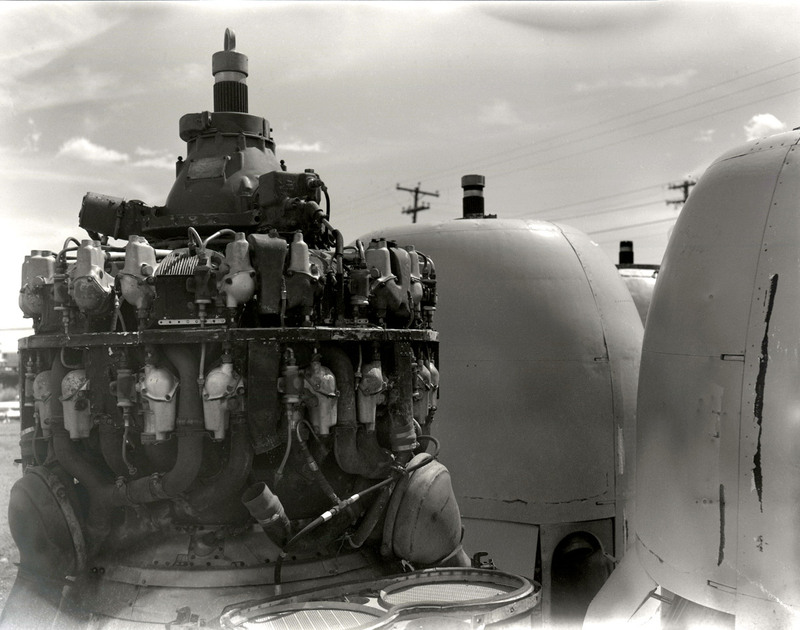 Aircraft buffs have written no small amount online about the many planes found on the lot over the years. 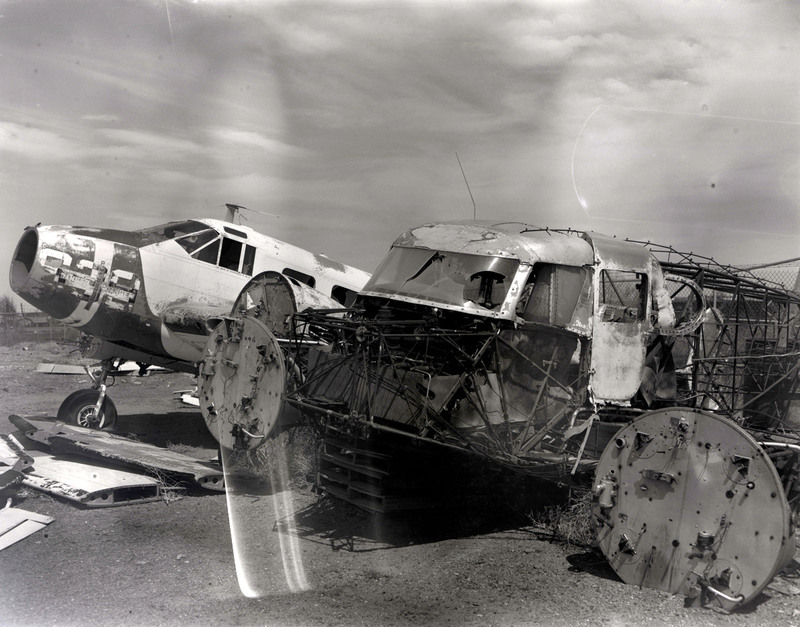 Dave Elliot and his Acme Aircraft Sales & Salvage bought the remaining inventory and has spent nearly two years moving it to his yard in Greeley, Colo., the land having been sold separately. There wasn’t a whole lot left by the time we made our pilgrimage, but what was still there was pretty cool, and we may have some of the last pictures of Bill Duff’s legacy, destined to close forever in just a few days. We signed in at the office, a jumble of display models, especially cool parts and placards, and other impossible minutiae. 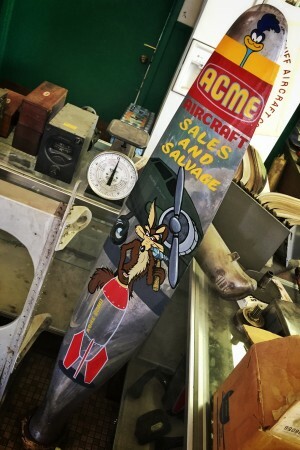 On the wall a sign reads, “If you bought the wrong part, you now have a spare!” and in the corner of the L-shaped counter is a chromed propeller blade painted with the Acme Aircraft logo surrounded by Looney Tunes’ the Road Runner and Wile E. Coyote. Back outside, we didn’t stick in a cohesive group. We all wandered our separate ways and took our separate shots. I took my first look through the immense ground glass of an Eastman 8×10 field camera and made those few shots with my Crown Graphic. This is the first time I’ve actually posted anything from my 4×5; perhaps it’s time to finally post the slides I made in the Southwest in 2012. 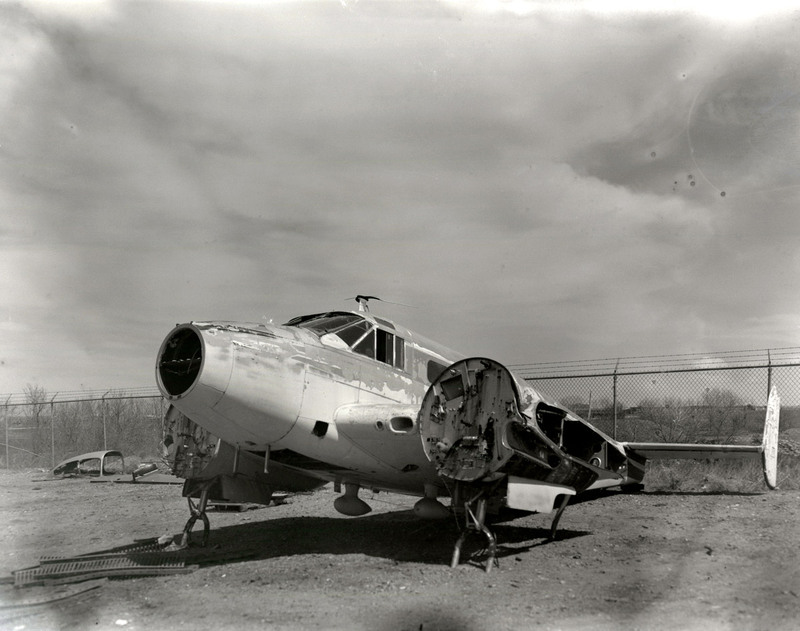 Duff’s yard was home to dozens of Beechcraft C-45 Expeditors and other military variants of the Beech 18, crashed Convair 240s and DC-3s, and a couple Cessna AT-17 “Bamboo Bomber” airframes, though everything remaining was pretty stripped. Craig made some gorgeous 8×10 frames, and I tried a few with the 4×5 before switching to 35mm. As you can see, my shots didn’t come out that great — I’m not 100% sure why but I can see a couple definite problems and have ideas about a couple more. First up: Underexposure. I rated the 40-year-old ASA 125 film at ASA 25 for the experiment; I think I need to go at least one more stop, as I’ve adjusted the exposure a bit more than I’d like to have to in these examples. It’s not unusable, certainly, and there is plenty of shadow detail. Second: Underdevelopment. This was my first attempt at developing 4×5 sheets at home, using the Yankee 4×5 daylight development tank I picked up a few months ago. I didn’t read that last link beforehand, but I wish I had. The Yankee tank can’t be inverted, relying instead on sloshing from side to side for agitation. As you can see, there was clearly less development near the center of the frames, and it was especially uneven toward the edges. I suspect it was a result of the developer in contact with the film exhausting and not being adequately replaced by the reduced agitation. Based on what I’ve learned since, I believe I’ll need to try agitating more frequently and developing a bit longer in the next round. These were developed in HC-110 dilution H (1+63) for 10 minutes at 68 degrees Fahrenheit, agitated for the first minute and for 10 seconds every minute thereafter. I think next time I’ll try 12 minutes and agitate 5 seconds out of every thirty, just to keep things moving better. Third: Water spots. I mixed up a liter of Kodak Photo-Flo solution (5ml concentrate) and like an idiot I completely failed to use it before hanging the sheets to dry. I’ve actually never developed without using Photo-Flo, so this was a good learning experience. Now I know why it is so highly recommended, especially for those developing in unfiltered tap water. Lastly: Damage. I’m not sure what damage the center of the frame at the top; is it evidence of a light leak? If so, where did it come from? What gave it that pattern like it was scraped? And why didn’t it affect the other two frames? There was quite a bit of dust evident in the scans — the scanner I borrowed in the newsroom needs a thorough cleaning, I think. I removed the worst in Photoshop and then adjusted the exposure a tad and called it a day. After switching to 35mm I shot a couple rolls with my Nikons — completing a roll of Kodak Ultra Color 400 and starting a roll of Agfa Scala 200x which I plan to have processed by Denver’s own dr5-lab. All in all, I had a great time and I really can’t wait to do it again. Perhaps I’ll even get some more useable frames from our next excursion. P.S. : Drew published his take on the meetup a few days ago.